Just in time for the 15th anniversary of the Deadwood premiere, we now have our first look at Deadwood: The Movie. The highly-anticipated series picks up 13 years after the acclaimed Western series went off the air, with stars Ian McShane and Timothy Olyphant back in the saddle. You can check out the teaser in the post below! This all-new, original movie based on David Milch’s acclaimed, Emmy-winning HBO series of the same name which debuted 15 years ago today, the indelible characters of the show are reunited after a decade to celebrate South Dakota’s statehood. Former rivalries are reignited, alliances are tested and old wounds reopened as all are left to navigate the inevitable changes that modernity and time have wrought. The HBO drama ran from 2004-2006 and was a hit with fans, many of whom have since been asking for more. 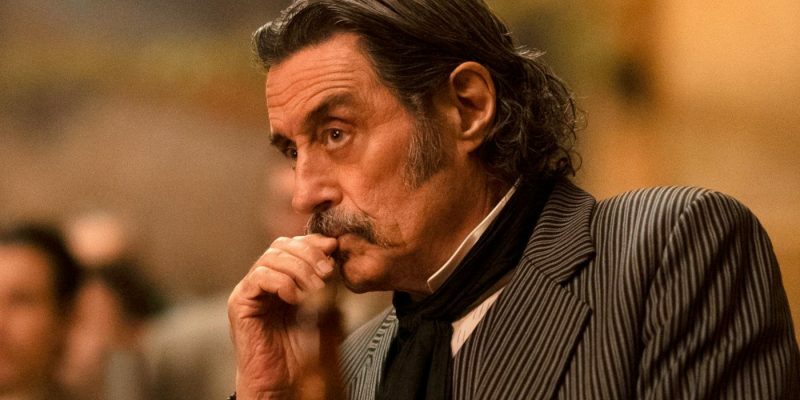 A Deadwood movie was suggested, although it’s been more than a decade since the series ended. Once the cable network canceled the show after a mere three 12-episode seasons, Milch’s original plan was to make two Deadwood movies and create a proper ending for the rivalry between Sheriff Seth Bullock (Olyphant) and foul-mouthed pimp Al Swearengen (McShane). The cast for Deadwood also included the likes of Molly Parker, Jim Beaver, W. Earl Brown, Dayton Callie, Kim Dickens, Dora DuFran, Brad Dourif, Anna Gunn, John Hawkes and Jeffrey Jones. Deadwood: The Movie premieres on HBO May 31. The post The First Official Deadwood: The Movie Teaser is Here appeared first on ComingSoon.net.